Goods and Service Tax (GST) is structured for efficient tax collection, reduction in corruption, easy inter-state movement of goods and a lot more. 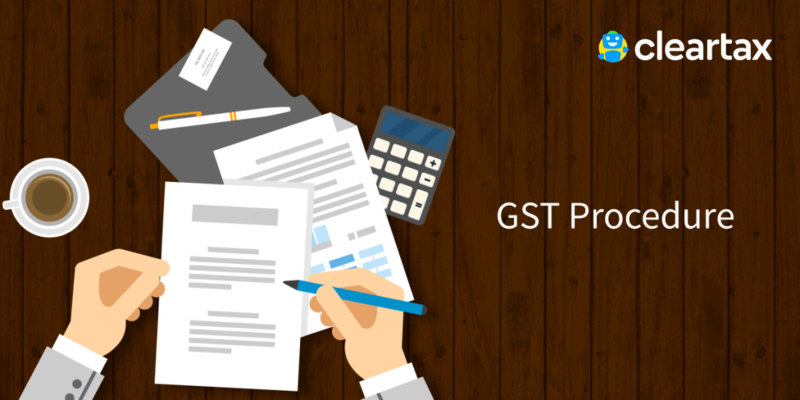 The GST Law provides for self-assessment to facilitate easy compliance and payment of taxes. It also explains the notices, the demand and recovery provisions when the taxes are unpaid, short paid and/or returns are not filed. Audit under GST is the examination of records maintained by a registered dealer. The aim is to verify the correctness of information declared, taxes paid and to assess the compliance with GST. Every registered dealer whose turnover during a financial year exceeds the Rs 2 crore has to get his accounts audited by a CA or a CMA. General Audit: The commissioner or on his orders an officer may conduct an audit of any registered dealer. Special Audit: The department may conduct a special audit due to the complexity of the case and considering the interest of revenue. The CA or a CMA will be appointed to conduct the audit. Under GST, every registered taxable person shall assess the taxes payable by them on their own, and furnish a return for each tax period. This is called self-assessment. A registered dealer can request the officer for provisional assessment if he is unable to determine the value of goods or rate of tax. The proper officer can allow the assessee to pay tax on a provisional basis at a rate or a value specified by him. A GST officer can scrutinize the return to verify its correctness. The officer will ask for explanations on any discrepancies noticed in the returns. Summary Assessment is done when the assessing officer comes across sufficient grounds to believe any delay in showing a tax liability can harm the interest of the revenue. To protect the interest of the revenue, he can pass the summary assessment with the prior permission of the additional/joint commissioner. If a registered taxable person does not file his return even after getting a notice, the proper officer will assess the tax liability to the best of his judgment using the available relevant material. This assessment is done when a taxable person fails to obtain registration even though he is liable to do so. The officer will assess the tax liability of such persons to the best of his judgement. The taxable person will receive a show cause notice and an opportunity of being heard. Demand and recovery provisions are applicable when a registered dealer has paid tax incorrectly or not paid tax at all. It is also applicable when an incorrect refund or ITC is claimed by the dealer. The proper officer will issue a show cause notice along with a demand for payment of tax and penalty in case of fraud. 3. CGST/SGST paid when IGST was payable and vice versa. Advance Ruling under GST means seeking clarifications from GST authority on certain tax matters before starting the proposed activity. This helps to reduce costly litigation. An advance ruling is a written decision given by the tax authority to an applicant on queries related to the supply of goods/services. DRC-03 is required to be filed while making payment of any additional tax liability. Learn through a step-by-step guide on how to pay and file GST Form DRC-03. GST Notices are of many types. Get a complete list! Reply to show cause notice on time, giving SCN reference no. in the show cause notice format. Karnataka Value Added Tax Act ( KVAT ) audit is required to be filed in the Form VAT 240. Read to know more about its applicability, format & procedure. Starting 1st October 2018, every e-commerce operator has to collect TCS on all the net taxable supplies. Click here to know more on TCS under GST. 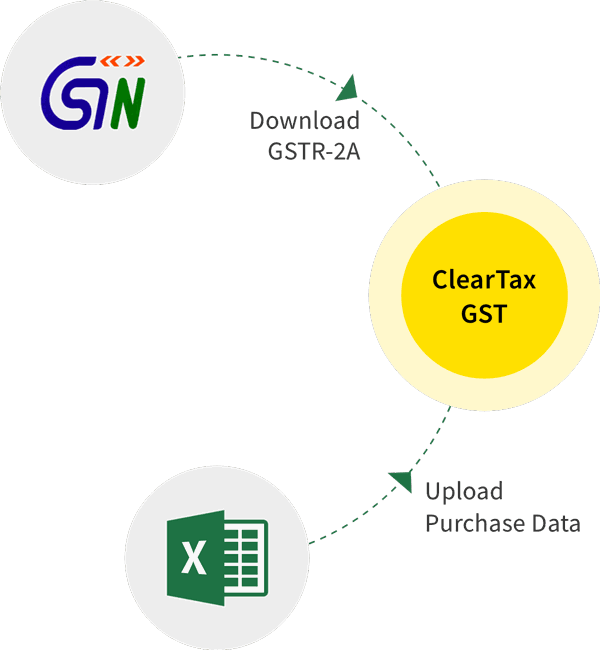 GST Reconciliation and matching automated ensure sanity of the Input tax credit utilised by businesses as its monitored by the GST authorities regularly. How can exports be made issuing bond or LUT under GST? An LUT or a bond has to furnished by the exporter in the form GST RFD-11 for export without tax. Chartered Accountants will play a huge role now, what with GST being the talk of the town. We tell you how to get your A game on with this handy checklist! Updated: 26/4/2017. If a person cannot pay his dues under GST, then he can pay installments on approval. Find out other GST recovery provisions. Payment of GST in cases of death and dissolution does not stop with the taxpayer's death or closure of business. The heir is held liable by law. Learn more. GST Law has provisions for special cases like transfer of business, where the transferee and transferor are both held liable to pay unpaid GST. Learn more. Updated:11.4.2017 Like current indirect tax regime, provisions of Best Judgement Assessment under GST are also to keep a check on assesses. Click here to find out more. Updated: 11.4.2017-Assessment means determination of GST tax liability. Apart from self assessment all other assessments are by tax authorities. Click here. If the applicant aggrieved by the advance ruling he can appeal to the Appellate Authority for Advance Ruling under GST. This is new in GST. Being new, GST will require many clarifications. So advance ruling under GST becomes vital to reduce tax disputes and costly legal battles. 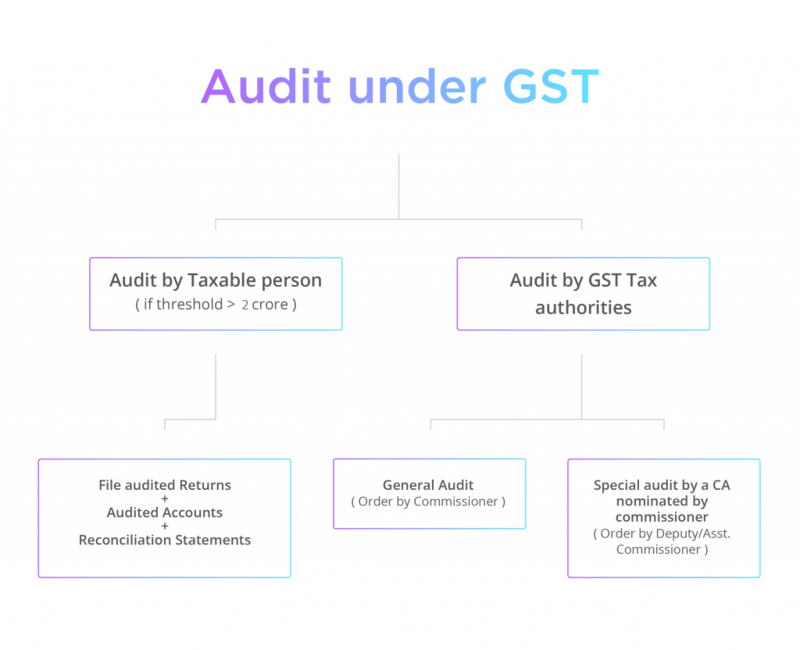 Audit under GST- When You Might Get Audited by Tax Officers? The purpose of audit under GST is to assess compliance with GST. Read more to find out when you can be liable for audit by tax officers.